Conrad Furey is a self taught Canadian Artist, with his work bordering on a naïf style. The bulk of his success has been with the memories of his East Coast upbringing, “Living away [from Newfoundland] means that I can get to the essence on the memories more easily, there’s less distraction,” “The years I spent growing up in Newfoundland, that’s where all these images are from.” “It seems that Newfoundland defines me and my life growing up on an idyllic coast of this grudg- ing isle,” he says. “Our front door looked out onto an ocean bay, and that was my focus. I remember thinking about how it would have been to follow in my father’s footsteps, living off the sea. I loved those times spent out fishing together, but I also realized I would have to make my own way in the world, as our back door symbolically looked out onto mines and other kinds of work. It seems I paint what I dreamt of doing with my life.”My portrayals of the everyday life of Canadians, marks me as an important National Artist. My works, although most definitely Canadian have a universality that makes them appreciated by peoples from all corners. Furey considered himself to be self-taught, pulled into expression by instinct rather than learned technique, and says he has rebelled against what little formal training he has had. Instead, he is following his own creative agenda. In this pursuit, he has employed many artistic media, and it seems that nothing is off limits for artistic manipulation. He paints on canvas and plywood structures, has experimented with bronze, resin, and stone sculpture, and has even designed a set of thirteen stained-glass windows. His art has a far-reaching effect and can be found hanging in schools and hospitals, local churches and government buildings. For over twenty years, he has been regularly commissioned for public paintings and murals in Newfoundland and Ontario. Furey’s versatility and broad appeal has made him a sought after artist. Conrad enjoyed exploring new territory with his work. He travelled to many places and this allowed him to come back to his studio in Hamilton Ontario and portray his adventures in his work. 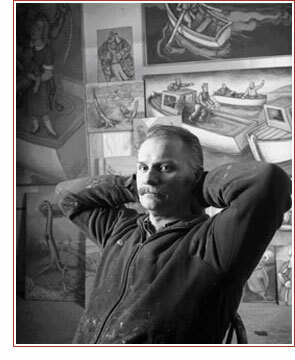 Conrad Furey passed away on January 23, 2008 of Colon Cancer at the age of 53 but his art will live on.